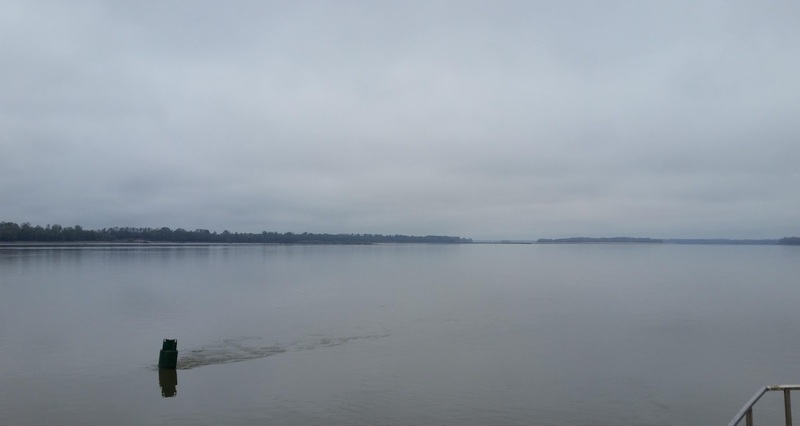 We are under way between Vicksburg and Natchez, making a long day on the river because it is too cold to do anything else. Tonight will be our first subfreezing night on the boat, and we'll be taking precautions to keep things from freezing. At least it will be only five degrees below freezing in Natchez, rather than the seven below in Vicksburg. 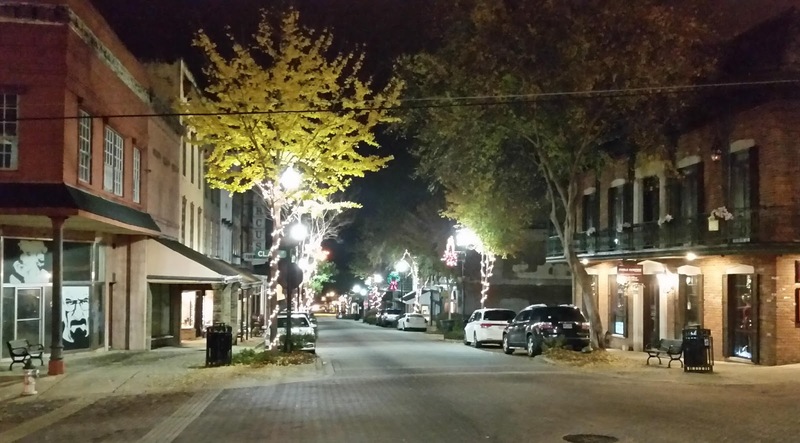 Washington Street, downtown Vicksburg, decorated for the holidays. With no rush to arrive in Vicksburg, we got a late start Sunday morning. That allowed me to sit at the helm for an hour and watch two towboats transit the problem area ahead of us on our AIS display. The chart said they were driving over dry land. As the second of the two made his transit, I deposited route waypoints in his wake, so we'd have a track to follow. Our choice to anchor just upriver of this area proved fortuitous, as the trouble area was just in range of our AIS and I was able to keep tabs on all the movements. We weighed anchor late morning and headed downriver toward Lake Providence Harbor. As we approached the trouble spot I was very glad we had been paying close attention to the daily Coast Guard announcements, and also that I had taken the time to plot one of the tows going through. 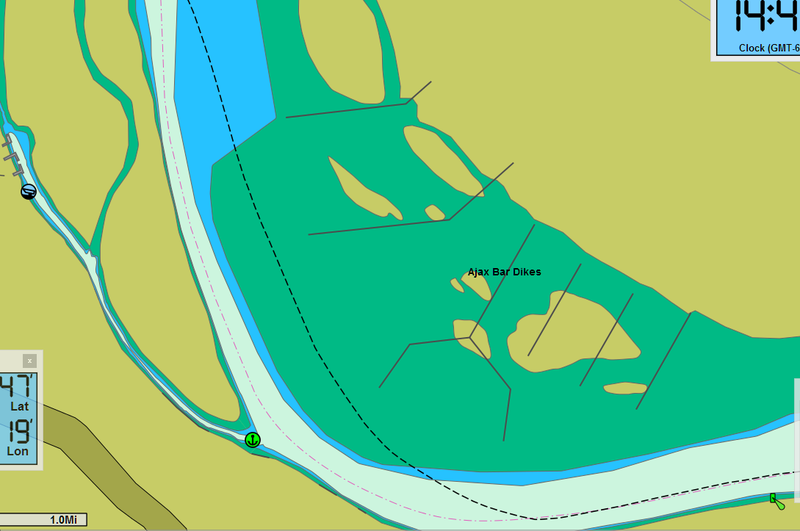 While the new pointway channel cut by the river was well-marked with buoys, the old bendway channel was also still marked, and it would have been easy to miss the turn and follow the sailing line right into trouble. We steered the route I had plotted in the morning and had deep water all the way through. 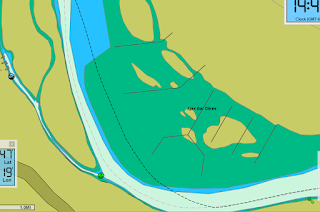 Our track over "land," where the river has carved a new pointway channel. This is the latest chart. Two hours later we passed an area of shoaling where several tows had run aground, but, again, by following the instructions announced by the Coast Guard, we had deep water and no trouble. It is worth noting here that the CG makes these announcements only twice a day. If we did not have a practice aboard of keeping watch on VHF channel 16 24/7, even at anchor or at the dock, we could easily have missed some of this critical information. With weather conditions too lousy to be hunting for an anchorage in Vicksburg Sunday, and thunderstorms forecast for Monday keeping us from going ashore anyway, we dropped the hook an hour upriver of the Yazoo turnoff, outside the green buoy line at the Marshall Cutoff, mile 449 (map). This was just a mile upriver of yet another shoaling area, on the green side, which had the tows passing well away from us on the red side of the river. Our anchorage at the Marshall Cutoff. The view is representative of most of the river. Note the current passing the buoy. 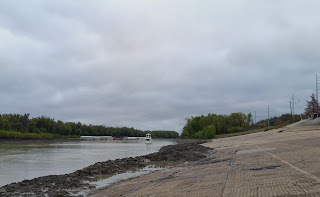 Monday morning we ruminated about weighing anchor and proceeding to Vicksburg. We knew the weather would be too lousy to splash the tender and go ashore, but we figured if we got an early start we could at least hunt for an anchorage and maybe get settled before we got drenched anchoring in the rain. Ultimately, two things swayed the decision in favor of just staying put another night: the fact that the thunderstorm and its associated winds would restrict us to anchorages with much more swing room than otherwise necessary, and the fact that the river would come up nearly a foot if we waited a day. That turned out to be the right decision, as will be clear shortly, but at 3:30 in the afternoon we were regretting it. That's because, out of the blue, I got a text message from good friend and fellow Red Cross volunteer David, who was moving a Red Cross vehicle from the disaster relief operation in North Carolina back to the maintenance center in Austin, Texas. He was coming across I-20 and was planning to stop for the night in Vicksburg. We would have braved the weather to get ashore to see him if we had been close enough, but from where we were anchored there was no place we could even tender in, at least not anyplace he could also reach by land. It was frustrating to be so close yet not be able to connect. We did see a bit of the storm Monday. Anchored in over three knots of current, it did not move us around at all, but we had enough lightning to prompt us to stow some electronics in the microwave for the duration. Wind and rain continued on and off through the night. I spent most of the day ripping apart the old flybridge chart plotter, extracting its keypad circuit board, and transplanting into the "new" flybridge plotter that had died an ignominious death. It's working now and back on its perch, with the old unit stored away as a hangar queen. Approaching Vicksburg. Bridges and casinos to the right; Yazoo to the left. Tuesday was overcast but dry, and the winds had dropped. 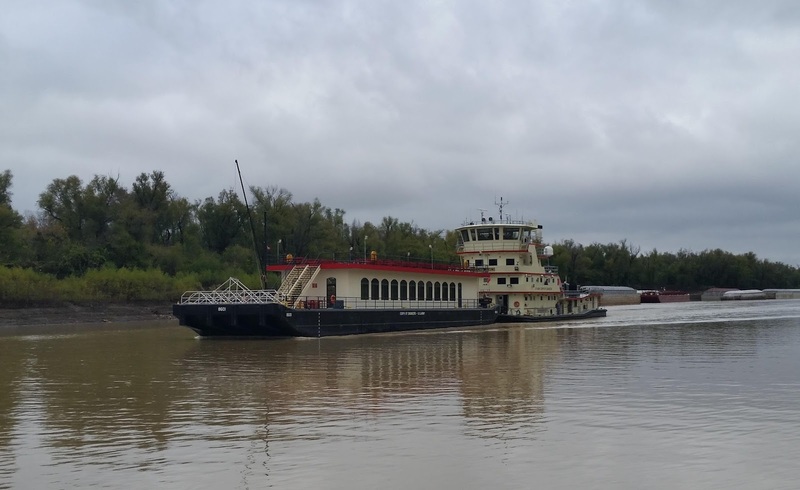 We weighed anchor, headed over to the red side to clear the reported shoaling, and continued downriver to Vicksburg. 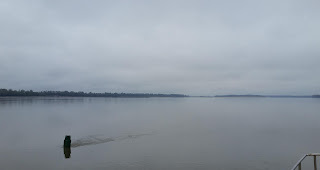 As we approached the turn, with the Vicksburg bridges ahead and the left descending bank lined with casino resorts, we could see the waters of the Yazoo emptying into the Mississippi -- they are the color of chocolate milk, forming a stark contrast with the main river. I spun Vector around and powered hard against the outside-bend current and into the Yazoo for the final leg to downtown Vicksburg. Murals on the Vicksburg flood walls. Once upon a time, Vicksburg sat prominently and majestically upon the Mississippi River. Civil War buffs may know that Farragut called it the "Gibraltar of the Mississippi," unable to withstand the pounding from Confederate batteries high upon the hill, and unable to elevate his guns to return fire, his fleet turned around twice in defeat. But in 1876, the mighty river did what 3,000 Union troops and Ulysses S. Grant could not. It cut through the DeSoto Peninsula, bypassing Vicksburg and leaving the city landlocked, at the same time stranding a piece of Louisiana east of the river. A large part of the old, now cut off, river bend became the aptly named Centennial Lake. 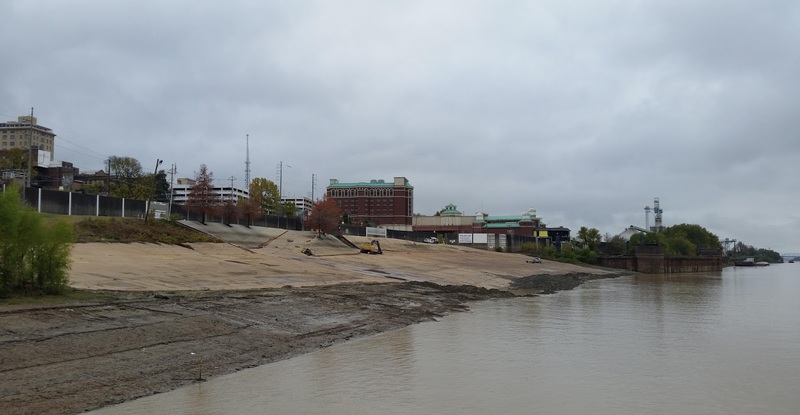 Such has been the fate of hundreds of riverside towns and settlements over the centuries, but neither the denizens of Vicksburg nor the state of Mississippi nor even the federal government could let Vicksburg suffer this fate unchallenged. After years of planning and work, in 1902 the Army Corps of Engineers diverted the Yazoo River, which formerly emptied into the Mississippi several miles upriver, into the old Mississippi riverbed, giving Vicksburg back its waterfront. Vicksburg and its historic waterfront now sit upon the Yazoo, or more accurately, the Yazoo Diversion Canal. Vector anchored just off the waterfront downtown. Working fleet area in the background. We found two knots of current in the canal, which looks to have been dredged recently with evenly graded banks (and a mountain of mud piled up on the concrete riverfront). That current worked to our advantage; we were able to slip over to the very edge of the canal just upriver of the concrete, and drop the hook in 12' of water just a boatlength from shore (map). We talked to the harbor tugs to be sure we were far enough off center to be out of their way. The current held us in a straight line parallel to shore; without it, the risk of swinging into the shallow bank or out into the working channel would have precluded anchoring here. We also would not have been able to do so with the winds of Monday's storm. Downtown waterfront with defunct casino hotel. Tall building at left is where we ate on the roof terrace. That made for a very short dinghy ride to the boat ramp, the one spot on the concrete waterfront where the mud had been cleared away. 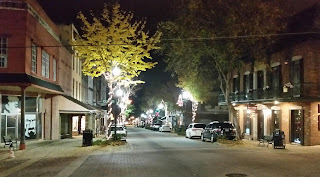 We went ashore around 4pm and had a nice walk around the historic downtown, festively decorated for the holidays. Underscoring the touristic nature of downtown, the main drag, Washington Street, had speakers embedded in the shrubbery on each block, playing holiday music. We had a nice dinner at the rooftop terrace restaurant, Ten South, atop a historic bank building, with a panoramic view of the city and the Mississippi Valley. 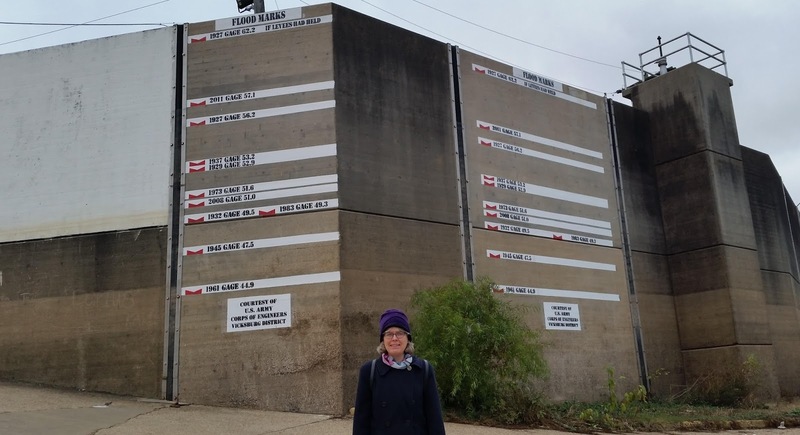 Louise on the river side of the floodwall. Marks reveal the level of some historic floods. Wednesday was the one relatively "warm" and dry day in the forecast, and after an early lunch we went ashore to do some provisioning. That involved taking a small shuttle bus called the N-Route from downtown out to the Kroger and back, adorned with backpacks. The transit system was a bit difficult to navigate, with no information available online or in printed form -- you have to call. Once we figured it out, it was a nice ride in a comfortable bus, with a chatty driver. We got to see a bit more of town and we came back loaded up with fresh food. This bus also stops at the outlet mall and Walmart, and a different line goes out to the riverfront casinos. M/V Mississippi IV at the Lower Mississippi River Museum. After returning from our shopping excursion, I dropped Louise back at Vector with the provisions, and returned ashore stag to do some more exploring before dinner. 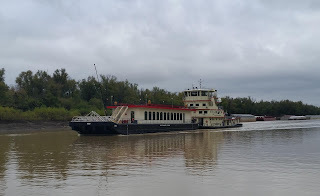 I had a nice walk around town and visited the brand new Lower Mississippi River Museum, with its star attraction, the retired M/V Mississippi IV, a Corps of Engineers "towboat" that also functioned as the inspection and public relations vessel of the Mississippi River Commission. Louise and I had stopped in to the Commission's headquarters downtown the previous evening, admiring the historic building and getting a peek at the enormous book, called "the bible" by rivermen, that once documented the changes in course and channel of the river over the course of a century. The Corps, the Commission, and Vicksburg go back a long way together. Most of the bridge equipment was intact, but here in the Radio Room it was very sparse. 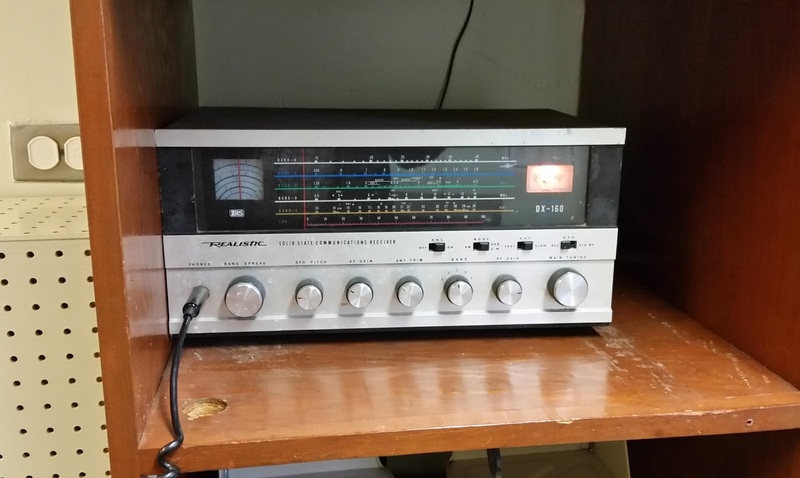 I don't think this Radio Shack short-wave receiver is, umm, realistic. The boat was palatial inside, a sort of odd cross between working towboat and river cruise ship. It was the fourth in a long line of such vessels, but the first to be powered by diesel engines. Its replacement, the Mississippi V, serves the same missions today. Its smaller cousin, the William James, passed us in the canal, both ways, on what looked to be a short river cruise for visiting dignitaries. M/V William James pushing what looks for all the world like a party barge. I also walked around the old railroad depot, now a museum, and along the floodwall, covered in murals. A gap in the floodwall allows vehicle and rail traffic to pass the depot; photos from the huge 2011 flood show the portable segments that close the gap being used (sadly, the depot is outside the wall). 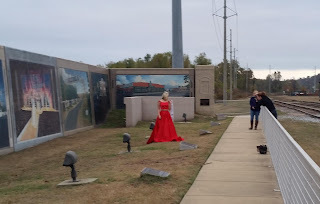 On my way back to the tender I passed a very cold looking model at a photo shoot in front of the murals; apparently, Miss Teen Mississippi. Miss Teen Mississippi. It's about 50° out. The photographer and her assistant are bundled up. We had a casual but tasty dinner at Rusty's Riverfront Grill right across the street from the M/V Mississippi, and decked the tender as soon as we returned to Vector. We wanted to get an early start today, so we'd have the option of going all the way to Natchez in the daylight. At this writing, the plotter says we will arrive there by 4pm. The old depot. Vector is right behind it. It's uncertain we will make it ashore in Natchez. Once again, we have to tender in to a concrete ramp. But it will be in the low 40s when we arrive, making for a very cold shore visit. We could spend all day there tomorrow, too, but again the temperatures will be in the 40s the entire day. Things warm up considerably on Saturday, but waiting to Sunday to depart cuts into the padding at the tail end of our schedule. We have friends flying into New Orleans on the 20th, and we really need to be off the river and well settled by then. Considering we have less than 300 miles left to New Orleans, that would see a slam-dunk. You may recall me saying here, though, that it's dicey to have a schedule on a boat. The fly in the ointment here is that the Industrial Canal, which connects the Mississippi River to Lake Pontchartrain, where all the marinas are, is closed at the moment. It was supposed to reopen on November 29th; then they pushed it back to December 7th. I just got off the phone with them and it's still not open; they are hoping to have it open "any hour now." If the canal does not reopen in time, we'll have to go downriver nearly to the Head of Passes and cut across Baptiste Collette Bayou to Breton Sound and back up. This detour is a minimum of three (long) days for us, and would eliminate any buffer at all. I'm calling the lock daily now for status. Until they tell me the lock is operating, we need to proceed at a pace that leaves us the time to go around.